Those behind the character masks and under the helmets and make-up in the original Star Wars movie tell their personal life stories. It must have been Christmas 1978 or around Easter 1979 when I, as a young lad of five or six, was on the ice planet of Hoth and slipped over in front of Luke Skywalker. I had found my way from Yoda’s swamp in the Degobah system to the Rebel Base on Hoth, where I hadn’t been prepared for the differences in terrain. With the ground suddenly so slippery, I skidded and fell backwards onto the very real – and cold – and hard! – ice, landing right on my pride. “Hey, are you okay?” As a young kid already feeling the weight of embarrassment descending upon him, this couldn’t get any worse, could it? Oh, yes, it could. Heading right towards me with concern in his voice was Luke, the hero who had saved the princess and blown up the Death Star, in full Jedi training regalia. “You took quite a tumble there!” My gosh, I felt stupid, and although I remember those words vividly even today I can’t remember the rest of what Luke said back then as he helped me up, brushed me down and gave me an autographed photo, inscribed “May the Force with be you”, signed by someone called…Mark Hamill…? Then he was off, no doubt to battle more AT-ATs, complete his Jedi training or save Han Solo from being encased in carbonate! Making full use of the soundstage space, the swamp sat in the middle of what must have been Stage 8 at Elstree Studios (due to it featuring an internal tank from which Luke could raise his crashed X-Wing), while the tunnels of the Rebel Base on Hoth were stretched around its outer edge, hence the curve you see in the film. I’m not sure it was real ice, but it certainly was slippery going from the swamp set through the Hoth tunnels and out of the stage, which is how I ended up having my moment with Luke. To such a young boy, it was embarrassing for it to have happened in front of someone I had only just seen in the original Star Wars, but having been around The Muppet Show‘s Kermit and company, and understanding even then how film and TV “worked”, I also knew who Mark Hamill was, and he couldn’t have been more caring or handled that situation any better. It was early encounters like these that kept me from being star-struck in life, but although I later met and worked with many “stars”, that signed photo of Hamill as Luke riding his Tauntaun will always be treasured as a special memory. After Empire Dad stayed at EMI with Henson’s crews on The Great Muppet Caper and The Dark Crystal and then mostly with Lucasfilm and Amblin through the Indiana Jones trilogy, Young Sherlock Holmes and Who Framed Roger Rabbit. Naturally, once you’ve witnessed Kermit, Fozzie and Gonzo landing a balloon in the big city for a song and dance number, or seen Harrison Ford being chased by a giant boulder and fighting off the evil Thuggee cult on a rope bridge (hanging off the side of a soundstage! ), visiting and growing up on the sets of Elstree in the ’80s meant I was never going to be cut out for a regular office job in accounting! 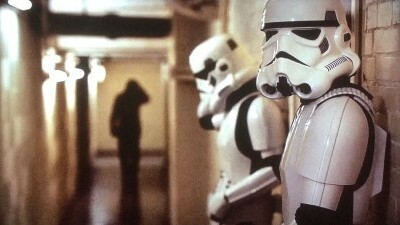 I was lucky to later set up shop at Elstree myself as an editor, and among many other projects was a series of documentary shorts that celebrated the Studio’s past, commissioned at the time of the facility’s rebirth after a period of closure, most notably marked by the opening of a new George Lucas Stage by Prince Charles in 1999. 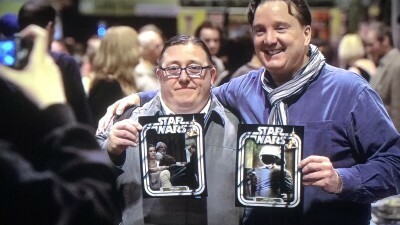 So it was with all this backstory and involvement myself that I was eager to check out Jon Spira’s new documentary feature, originally titled a little more snappily as Elstree ’76, which promised to delve into the stories and experiences of those actors, bit-part players and extras that remained largely hidden under latex masks or make-up during the original Star Wars shoot, but that have gone on to launch their own follow-up careers as attractions to legions of the franchise’s fans on the convention circuit. 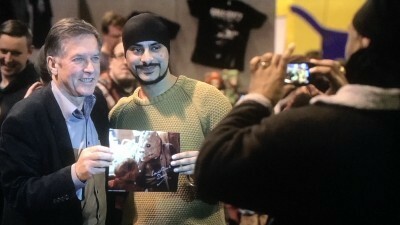 It’s a fascinating concept, to talk to the many people who we have seen in the film but would never recognise and bring them to the fore for a change, and again, having been involved with a few Elstree events where we have been able to welcome the likes of Dave (Darth Vader) Prowse, Kenny (R2-D2) Baker, Jeremy (Boba Fett) Bulloch and any number of Stormtroopers, I was looking forward to hearing more of their insights and anecdotes. It’s within the “casting” of Elstree 1976 that Spira hits his first hurdle. Being that this isn’t technically a Lucasfilm-endorsed documentary, he’s had to take his pick from the names that could be argued are not all among the most premium of those many fans might think of when discussing the majority of Star Wars‘ masked men and women. Sure, Prowse is almost a household name, but he was before Star Wars came along, especially for British kids of the 70s who will remember him for the road safety campaign as the Green Cross Code Man, which his superhero bodybuilder physique was perfect for (he also trained Christopher Reeve to become the Man Of Steel for Superman: The Movie between Star Wars gigs). But even if we know we won’t be hearing from the likes of Ford, Hamill, Fisher and the other major stars of Star Wars, there’s still a hope that we may recognise other names further down the participants’ list. However, Lucasfilm has an infamous (and unofficial) ‘naughty and nice’ list (call them ‘Friends of George’, or not) that seems to have remained in place even after Disney’s purchase of the company, and there’s a reason the likes of Anthony (C-3PO) Daniels, Kenny Baker, Warwick (Wicket and Willow) Davis and Peter (Chewbacca) Mayhew – who have all kept to the official Lucas line over the years – are not featured here and remain part of the Star Wars line-up that is enjoying renewed attention thanks to The Force Awakens and the continuing new films in the series. Prowse isn’t in that company any longer, and is rarely if ever invited to Lucasfilm-authorized events, although he now makes much of his living on the alternate convention circuit where his “Dave Prowse is Darth Vader” signature line continues to rile Lucasfilm up the wrong way (as an aside, it’s saying something when these guys have to add their character names to their signed photos, just to make sure even the die-hard fans remember who they are). That tidbit is lightly touched on in Empire 1976, but the real juice behind Prowse’s fall from grace to Lucasfilm’s perceived dark side remains unmentioned, possibly because it was likely a situation of Prowse’s own making, being that, during production on the films, Lucas was consistently frustrated by his blabbing of plot points and a certain disregard for the material. The story goes that this is the reason Prowse was given dummy lines for the pivotal reveal to Luke in The Empire Strikes Back and why he was replaced with another actor by the time Vader’s helmet was removed at the end of Return Of The Jedi, a scene that was filmed shrouded in secrecy and with the barest of a skeleton crew one weekend morning. Coupled with Prowse’s continued complaining in the press that he never knew his British-Cornish accent was going to be replaced with the admittedly far more menacing tones of James Earl Jones, and one can start to see why ol’ George might have got the hump! It’s stories like these that the fans want to hear – from an authentic if not authorized source either way – but even though the Lucasfilm-friendly bunch don’t, or can’t, show up, it’s still as if Spira and Elstree ’76 doesn’t want to upset the cart too much, since there’s none of that kind of gossip in play here. In fact, to be fair and honest, there’s a certain lack any real talk of being involved in Star Wars at all, with possibly a scant twenty minutes or so in an hour and forty minutes of talking heads actually spent discussing being on the set of the original film. Not all of these guys will have been blacklisted by Lucasfilm, and it’s more likely that they have simply fallen off anyone’s radars than anything, but then their remarks are from the aspect of being so on the fringes of the action that clips from the movie have to highlight where some of the more obscure faces are to be seen, sometimes literally on the edge of frame, with a freeze-frame styled judder effect whose movement actually counteracts the intention and sometimes comes off as being jokey or downright comical. It is impressive (most impressive) that Spira has managed, through fair-use means I’m guessing, to secure the use of not only moments from the original Star Wars but from The Empire Strikes Back and several other films and television clips for illustrative purposes, but it seems he’s being careful not to tread on any toes so that the famously protective company doesn’t come down on him like a ton of bricks. Indeed, relying less on clips is the method of how each of the band of names and faces unde the microscope here are identified, by way of their resulting action figures which, being items found in the real world, can be photographed and shown infinitely, which they almost are lovingly here. It’s a cute gimmick, backed up by those juddery frame stills, that somewhat validates those appearing here and, whatever their involvement may have been, there are not many people who can claim to have been turned into an action figure! Sadly, this is sometimes as exciting as it gets: there seems to be a cattiness amongst the lower echelons of the Star Wars convention crowd and it seems that some are more “worthy” than others (clue: they’re not; they are all just lucky enough to have been featured in a B-picture that unexpectedly changed the movies, and largely all failed to parlay their appearances into flourishing careers). Even Prowse and Bulloch – something of a cheat since he wasn’t even in the first film under discussion here – who both had respectable careers before Star Wars, didn’t really seem to do anything else but rest back on their connection to the films and play happy to fans and conventions that wanted to whisk them around the world for personal appearances – although why not and who can blame them? Having met both several times, each takes the adulation with a pinch of salt and are as genuinely and self-effacingly bemused at their “celebrity” as anyone. That’s not true for everyone here, however, and X-Wing pilot Angus MacInnes ultimately comes over as a slightly bitter someone who would have maybe liked to have had a better shot (he did turn up in several other roles in films such as Judge Dredd), while Derek Lyons almost takes the opportunity to use his on-camera interview as a counselling session, which perhaps Spira and his editors might have spared him (and us) since there’s a moment where he comes close to breaking down, such is the fleeting and fickle finger of fame. 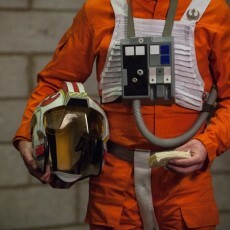 On the flipside, there’s a raw honesty on show, with many admitting they didn’t know or even understand what they were getting into (Garrick Hagon as Biggs, largely cut from the film, and Anthony Forrest, whose character was cut from film completely), and the matter of fact reaction to the film’s huge success is classically British to an extent. But while the film is sold as being about the stories of the people behind the masks, being in Star Wars is largely the most exciting aspect about them. Which means the rest of the film deals with their everyday lives: where they came from, what their hopes were, how they ended up in a galaxy far, far away…and the bump that many of them got when it ended, leading pretty much the whole bunch to turn what connection they had into a secondary career of selling their autographs to hungry fans eager to snap up any slice of memorabilia. This is not to personally slight any of the faces in Elstree 1976 – they all come off as salt of the earth types (especially John Chapman, who takes none of it seriously) that essentially understand their place on the entertainment spectrum – but it’s something of a lack of content in the documentary itself when a film with Elstree in the title and Star Wars as its ostensible focus point comes off as not much more than a mix of profiles of everyday folk who once “did a thing”, and one wonders if, without some of the bigger, Lucas-endorsed names, whether it was really such a solid idea for a feature in the first place. There’s a very good DVD extra in here, for sure, perhaps at under half the length or at least with twenty minutes shaved off the running time. Funded by Kickstarter, I am always wary of these kinds of documentaries, where pretty much anyone can raise some money and make a film. Several have disappointed, mainly due to a lack of focus on their subjects without experienced collaborators or a worthy executive producer to point out any shortcomings, with really only Superman Lives, the doc about Tim Burton’s abandoned film, having impressed me. A lack of focus isn’t really Elstree 1976‘s main issue, although it does wander off into some tangents that a fresh pair of eyes might have helped reign in somewhat more tightly, even if it does its best to (fairly authentically) recreate some buzz on Elstree’s soundstages and corridors (though not, from the looks of things, the ones that were actually used). But there is a lack of any real interest (even with the slightly precious Paul Blake – Greedo himself – in attendance there’s not any question of who shot first), and one must wonder who the film is aimed at: the Star Wars fans who just want a photo and a signature and don’t really care about who these people are as they pass them at the conventions for a more “important” name, or is it for a wider audience, as a way to shed some light on some everyday people who have these one or two extraordinary experiences among them in common? Certainly if this is the case then some additional context is needed, since anyone not a Star Wars fan won’t know who the characters are or what the action figure shots are depicting. A good number of an unaccustomed audience may even wonder just why these people have had a film made about them, even if the majority of them seem very nice people who fell into an extraordinary situation. So we must assume this is for the fans, to bring some attention to those who were mostly never seen but who brought to life some of the most recognisable characters not only in the Star Wars saga but in cinema itself. But while we get Darth, Boba and Greedo, there’s actually very little to discover once we get under the masks, and fans will already know the stories that are on offer. I’ve heard these guys in person and been told many terrific anecdotes and stories, none of which are touched on here, and that’s what’s really missing. 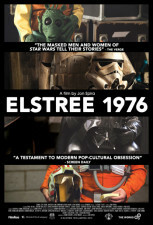 Elstree 1976 is a great concept, with sometimes interesting people (of them all, Stormtrooper Laurie Goode, the one that famously banged his head and is now pursuing a music career, seems the most balanced and philosophical about the whole thing), but a lack of willing to really push its subjects for anything new or exclusive does put the brakes on enjoying the result. Admittedly, the time for recollections may have come and gone, with the cast all headed for old age no matter how full of vim and vigor they may seem. There’s an occasional spark – Pam Rose is as forthright with her thoughts as anyone, although her few days as a Cantina alien don’t really lend themselves to being able to say much about the filming itself (and any slight revelation comes about another actor in another film) – but also a slightly desperate air, as if simply appearing in this film is another way for some of the participants to validate their connection, just as Star Wars fever begins again. Obviously a labour of love for its director, Elstree 1976 sadly fails to live up to its promise. In a word, no. The question of wide audience appeal of the actual documentary aside, this single DVD edition does nothing to bring any extra excitement to the title, meaning those interested in a curious look would do better to catch Elstree 1976 in the current Netflix line-up, where at least it can be enjoyed in HD. I’m even at odds as to why this version has been issued in any case, when a “Director’s Edition” includes a handful of extras including a tour of the George Lucas Stage at Elstree – not a space actually used in any of the three original Star Wars films (it didn’t exist then and wasn’t opened until 1999), even though Lucas did return to shoot one scene of each of the prequel trilogy films as a good luck charm. Surely this is the kind of title aimed squarely at film-freaks and collectors who want all the bells and whistles? I understand that both DVD and manufactured-on-demand BD-R versions of the Director’s package have been made available, since some of even the most dedicated tech-philes still haven’t given over to the lure of Blu-ray HD, but in this day and age, and especially for such a core collector-aimed title as this, a standard definition vanilla DVD just seems a totally redundant option. 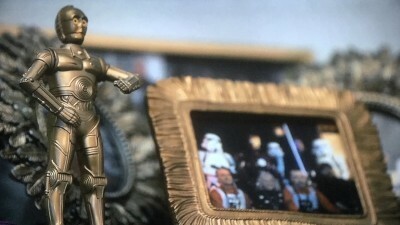 As basic as the disc presentation and its fairly ugly menu is, the packaging does nothing to enhance things, serving up a regular keep case containing a standard sleeve that is in danger – by way of many recreated stills featuring costumed reproductions – of overplaying the Star Wars card and emphasising the connection to a point that can’t, ultimately, meet fan expectations. With not a single item of material other than the very basic menu on the disc, this at least gives Elstree 1976 a chance to look as good as it can in this standard definition presentation. 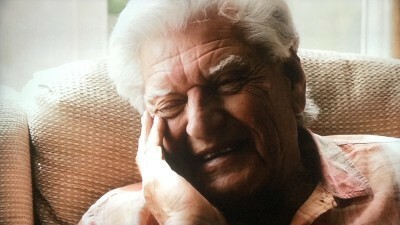 Most of the photography is up to scratch to begin with, and although one might have expected the professional grading process to have fixed the overcast brightness fluctuations in several of Dave Prowse’s interview segments, it all looks solid and sharp enough for this kind of material. Creating a 2.0 or 5.1 mix is not merely a case of panning dialogue, effects and music around the soundstage, and one of the biggest drawbacks (and a personal bugbear!) to these kind of Kickstarter documentaries can be the lack of full attention given to the sound, from inexperience in capturing the audio recordings adequately to begin with, to a lack of understanding in how to balance a final track. Again benefitting from a professional pass, the sound for Elstree 1976 is fairly robust, without any of the usual pops or hard audio cuts than can reveal an ultimate lack of polish. 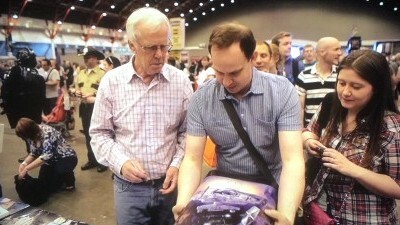 Jeremy Bulloch’s interview has unfortunately not been captured with a close mic, resulting in some ambient room reverb, but even here some audio tinkering seems to have managed to dampen this and restore an acceptable clarity. For over an hour and a half of talking heads, one does wonder what the point of a 5.1 mix is, though, when the dialogue would mostly come from the center speaker anyway, and it does feel a little like a check of a box to be able to have an additional spec listing on the back cover, because there’s no discernible difference or benefit from the track. A film made by a fan for the fans, or an introduction to Star Wars for people that might react to it the way the majority of the participants here did when they were offered it in the first place? Either way, Elstree 1976 lacks a truly compelling reason for being, suffering from its lack of Lucas-endorsed names and, in lieu of that, any revelations or even entertaining anecdotes. 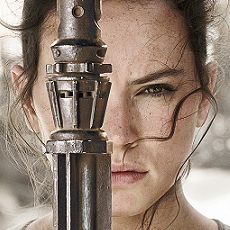 The focus on the people rather than Star Wars itself will again appeal or not, although that its big selling point is spread so thin throughout the film is also something of a disappointment. The point of this barebones disc is also a big question mark when any fan will probably want to get the set with additional footage. My suggestion is that most will be safe in passing on this one; the still curious may want to look on Netflix first, where it currently sits with several other like-minded and quirky docs of a similar nature.